I wanted to follow up on my post last week about standard save % and the idea that it could lead to overvaluing goalies who see more shots on average. 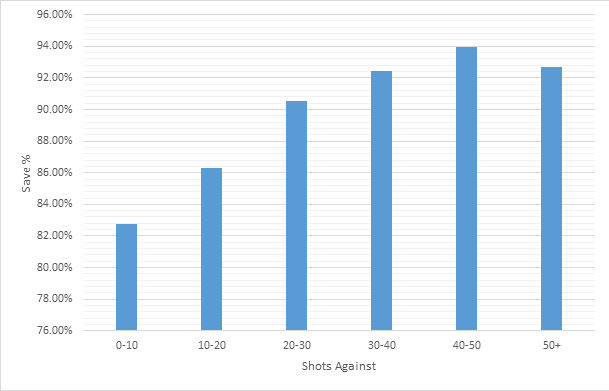 The chart below shows the total save % for all goalies from 2011-2012 and 2012-2013 broken down by shots against. The slight drop off in save % for 50+ shot games should be taken with a grain of salt due to the sample size there, there were only 10 games in that bucket, versus over 250 games in all the other buckets (excluding the 0-10 bucket, which has 145 games). Nevertheless the trend is pretty clear, as shots against rises, save % tends to increase as well. I have a few theories as to why we might see this. One possible explanation is that there are some score effects creeping in and the high shots against games are coming when the winning team is sitting back and allowing many low percentage shots from the outside. It’s also possible that a goalie facing a lot of shots gets “zoned in”, although I think this is idea is more of an invention of the media than any sort of reality. If we look at specific goaltenders, Sergei Bobrovsky and James Reimer provide good case studies of this effect in action. Both goalies saw large increases in save % year over year, with Bobrovsky going from a terrible 89.86% up to 93.17%, earning him a nod for the Vezina trophy. Similarly, Reimer’s improvement to 92.36% from 90.04% helped lead the Leafs to their first playoff berth since the last lockout. If we look at a breakdown by shots against though, we see that both Bobrovsky and Reimer played in more games where they faced more shots, with Bobrovsky seeing more than 30 shots in 54% of his games this year, vs. only 34% of his starts in 2011-2012. Reimer also saw an increase, although not as pronounced as Bobrovsky, facing over 30 shots on goal in 59% of his games in the current season, against a 53% total last year. This isn’t to say that neither Reimer nor Bobrovsky played better this year. Indeed, if we look at the year over year save % for both goalies broken down by shots against, we see a rise in save % for both the 20-30 shot bucket and 30-40 shot bucket (the only buckets where there were a reasonable amount of games to make a comparison). The other interesting thing to look at is how each goalie fared against the league average for each shot bucket. If we look at all goaltenders over the past two years, goalies who faced 20-30 shots had a save percentage of 90.51%, while netminders who saw 30-40 shots fared better at 92.42%. Comparing Reimer and Bobrovsky to these numbers we see that in 2011-2012 both players were below average in each bucket, while in the current year Bobrovsky managed to play significantly above average when facing 30-40 shots. Similarly, Reimer excelled (although not as much as Bobrovsky) when the Leafs opponents fired 30-40 shots towards the net, although he did seem to struggle when only facing 20-30 shots, posting a sub-900 save percentage. I think there’s more to be explored with this data, and I think the first chart puts more evidence behind the argument that pure shooting percentage isn’t necessarily the best metric to judge a goaltender by. The other thing to keep in mind is that this is only data from 1.5 seasons, I’m hopeful to repeat this analysis with data going back to 2007, but that will require a more stable internet connection than I have access to right now.